Defence scientist Joyce Mau (middle) with colleagues, on trial at Osborne. The ultimate operating concept that Mau and colleagues have is for a SPAD sensor and laser system to be mounted on a gimbal on a hovering drone tethered above the ocean surface, scanning the depths for underwater vehicles and sea mines. After receiving funding from RAAF Plan Jericho, the team quickly moved from a plan on paper to proof of concept at sea. 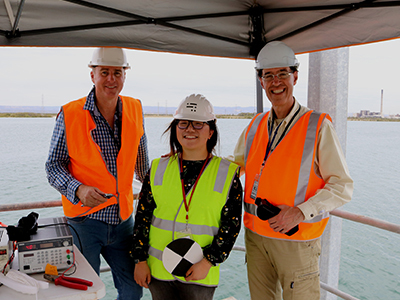 Mau explains that they started testing with the sensor mounted off a wharf at Adelaide's Osborne shipyard. "This is new territory for our SPAD system, so we wanted to make sure we could see through water before more complex at-sea trials. The ultimate system would use a tether comprising power supply and fibre optic data cabling to remove the need for wireless communications." After refining the system, the scientists travelled to HMAS Stirling to point their SPAD sensor off the side of a boat out to sea. They also took the opportunity to measure the open water transparency using Secchi disks. These are pizza-sized disks painted with alternating black and white quadrants, and are lowered into a body of water until no longer visible. This depth of disappearance, called the Secchi depth, is a measure of the transparency of the water. While the team successfully demonstrated underwater detection, Mau says there's still plenty of room for improvement, including optimising the optics and image processing. The current SPAD chip, revolutionary though it is, has a mere 32×32 pixels of resolution. Team leader Dennis Delic says the new 256×256 version of the chip will dramatically improve the sensor's capability. This "3D" chip has been designed in collaboration with long-time collaborators Milan Polytechnic, Monash University and chip fabrication specialists SilTerra (Malaysia) and the Fraunhofer Institute (Germany). Two chip layers, one each from SilTerra and Fraunhofer, will be joined together to create a unique sensor. Initial trials with a custom-built, heavy-lift, unpiloted multicopter version of the SPAD system were conducted over the waters off the South Australian coastline recently. Mau says they were very pleased with the results. The team's achievements in a short space of time, spurred on by an opportunity to demonstrate their capabilities, has been an amazing engineering feat.